From the moment your child walks through the door, they will enter a world of exploration that actively develops cognitive, social, emotional, and physical abilities, sharpens skills, and sets the stage for a happy, productive lifetime of learning. The Waterford Preschool program is the foundation of your child’s education. Waterford's preschool programs are designed according to research-based objectives and skills. This is accomplished through carefully crafted daily lessons that include hands-on and exploratory learning, explicit teacher-directed instruction, opportunities to practice, and objective-based assessments. Our PreK-4 students also enjoy the benefits of the Waterford Institute’s award-winning computer-based curriculum, designed to individualize several years of comprehensive language arts, math, and science education. 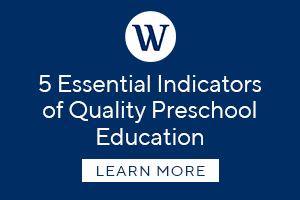 The nurturing environment of the Waterford Preschool program promotes healthy emotional, social, cognitive, and physical growth and development. In Preschool, children begin the process of becoming readers, writers, scientists, artists, listeners, and speakers. Teaching is both direct and supportive as children are involved in whole group, small group, and free choice activities each school day. And they receive a wonderful introduction to visual art, music, and dance. A key element to Waterford School's preschool foundations is the nature-based exploration. In Fall of 2018, Waterford unveiled a new Outdoor Classroom that supports this program and the daily importance of play. See the full scope of Waterford's PreK Outdoor Classroom. This program is offered to 3-year-olds and is the beginning of your child’s education at Waterford School. PreK-3 focuses on hands-on learning, exploration, creativity, literacy, writing, math, and social and emotional development. The ultimate goal is to establish habits of learning while teaching a curriculum that is vibrant and engaging for young minds. Students will learn a hierarchy of skills and objectives to cultivate all areas of their development. Art, Movement (Dance, Free Expression, Yoga), Music, and Library time are embedded into the weekly schedule. This program is offered to 4-year-olds. The focus of PreK-4 is to continue building a strong foundation for future learning, and to prepare the child for Kindergarten. PreK-4 is especially important in continuing to reinforce math, literacy and writing, executive function skills, social and emotional development, and a love of learning that will last a lifetime. Art, Movement, Music, Dramatic Play, and Library time continue to be a part of the student’s day. This program is offered to both PreK-3 and PreK-4 students. In addition to receiving core curricular instruction, students enrolled in Full Day will eat lunch together in their classroom (box lunch options available through the school dining hall), have rest time, play outdoors, and will be able to reinforce their core instruction through child-directed centers and enrichment curriculum. Before and After School Care is available daily from 7:00 a.m. to 8:15 a.m. and again in the afternoon from 3:00 p.m. to 6:00 p.m. for preschool students on days the child attends classes. Before and After School Care provides an enrichment-care program for families. and can be used on an hourly basis before and after school. Please contact the admissions office for more details about this program.